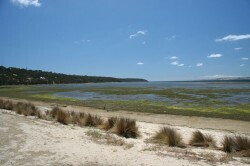 We stayed at Tailem Bend, which meant an easy drive (approx. 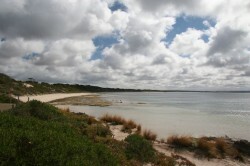 160kms to Cape Jervis). Tailem Bend was nothing to right home about, so I won’t. The ferry will take caravans at 1pm and 6pm, and we were there for the 1pm trip. We were directed into the outside lane, (meaning last on), I had to leave the car and Russ had to reverse onto the ferry! How much fun do you think that was for him!! Everything went well, until the very end, where he was assisted with ‘a little bit left and a little bit right’. The cost was $530. We were faced with very choppy seas, and passengers were at times quite audible with ‘oohs’, and Russ was very pleased that the trip only took 45 mins. I was vocal with the ‘oohs’ in the beginning, but then I found it to have a ‘lolling’ effect. Visited the Info Centre, ten minutes from the ferry and decided to stay at Brown Beach camping area, on the northern side of the island. 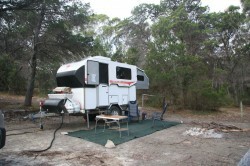 There are very new and clean pit toilets, a BBQ, a very shallow, but lovely beach and only $5 per night. No power, but there is a hot shower. 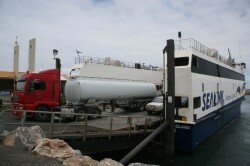 One problem is that it is right on the main road to the ferry, so the noise becomes noticeable for an hour either side of the ferry’s departure. Today we drove to American River for a BBQ lunch. Loads of water birds, a place to purchase oysters in season and we had the company of a pelican, whose beak didn’t line up at the end (who’s supported by locals), join us for lunch. We were in a new shelter, protected from the wind, but still able to enjoy the beautiful beach and enjoyed lamb cutlets, sliced potatoes and salad. What more could you want? A group of American sealers landed here in 1803 and camped alongside a narrow inlet from the sea – at the time mistaken for a river, hence the name. We were wondering what fauna and flora is found here and not on the mainland. The Kangaroos have evolved differently from those on the mainland, which is evident in the Kangaroo Island (KI) Kangaroo, which is a subspecies of the Western Grey Kangaroo, being smaller, darker and has longer fur than its mainland counterpart. Tammar Wallabies also have smaller and finer features. I’ll mention more of, what we find, really interesting differences throughout the blog. We haven’t decided whether to move on or not yet – we’ll keep you informed.